Wake your mom with a smile! 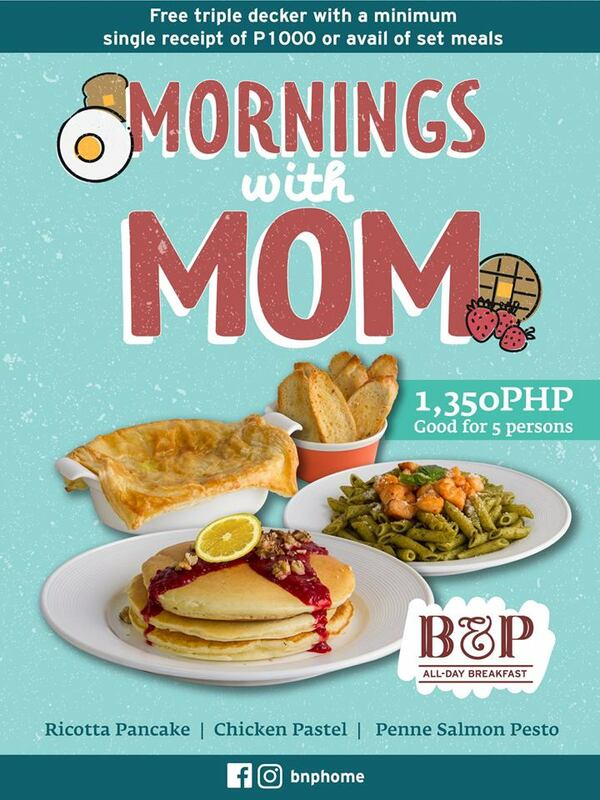 Avail of B&P 's Mother's Day Promo, get one raffle entry and a chance to win your mom a CCA Short Course! B&P All-Day Restaurant is located at Robinsons Cyberscape Alpha, 1605, Garnet Road, Pasig. For inquiries, please call 0926-1901751. *Pay for just four, and mom eats for FREE! Not valid in conjunction with other discount privileges. For inquiries and reservations, please call Eastwood Richmonde Hotel at (632) 570-7777. 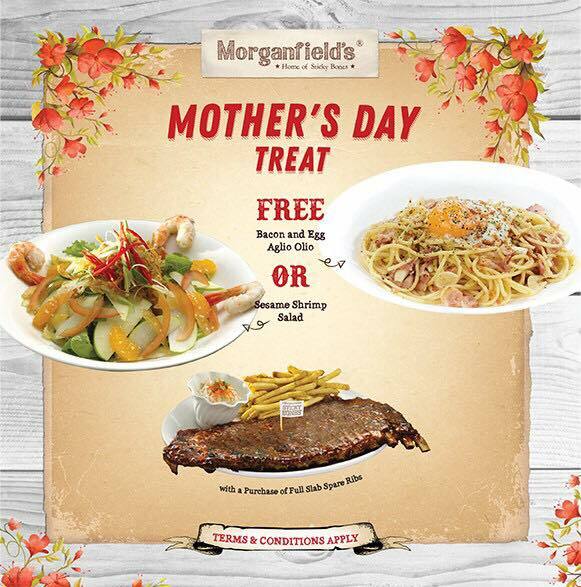 Make your mom (and the moms in your lives) feel more special with Morganfield's Mother's Day Treat Promo. Get a FREE Bacon & Egg Aglio Olio or Sesame Shrimp Salad when you buy the well-loved Full Slab of Spare Ribs. 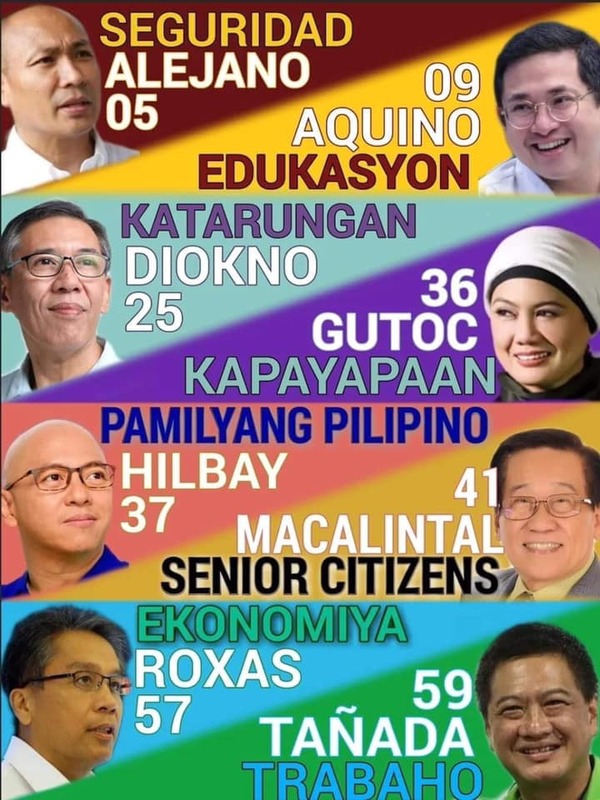 This promo’s good until May 13, 2018 only. Visit them Ayala at The 30th, SM Mall of Asia or Uptown Mall BGC! Saying "I love you, Mom" can be as easy as 143! 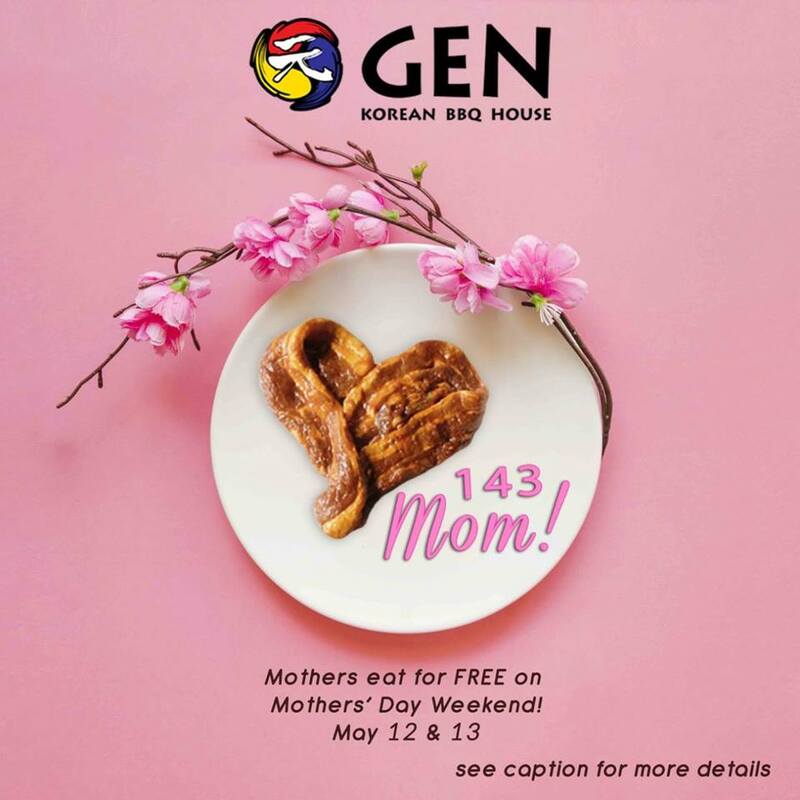 Treat your mom to a feast fit for a queen with GEN Korean BBQ House's All-You-Can-Eat U.S. premium meats and seafood this Mother's day weekend! 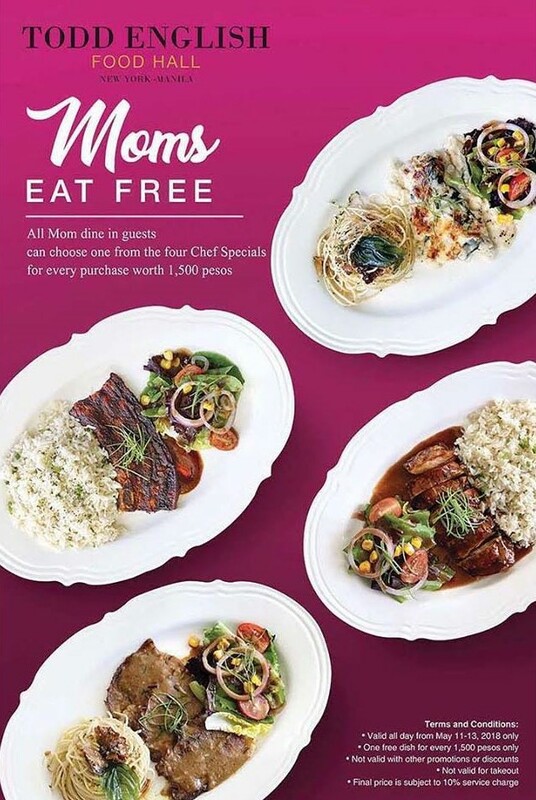 Mothers EAT FOR FREE with 3 full-paying adults! GEN Korean BBQ House Mother's Day Promo is available whole day of May 12 and 13 ONLY. For inquiries and reservations, contact them at: ☎️ ‎(02) 541-2766 or 📱 ‎(+63) 917-621-8249. Celebrate Mom’s love at House of Wagyu this weekend. 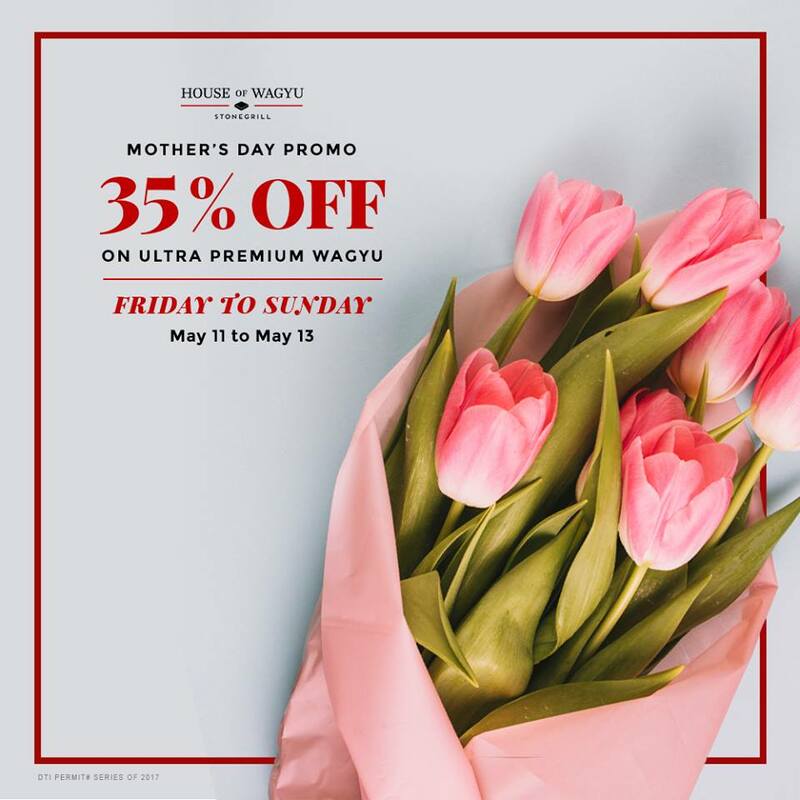 The whole family gets 35% OFF on Ultra Premium Wagyu on May 11-13 for lunch and dinner. 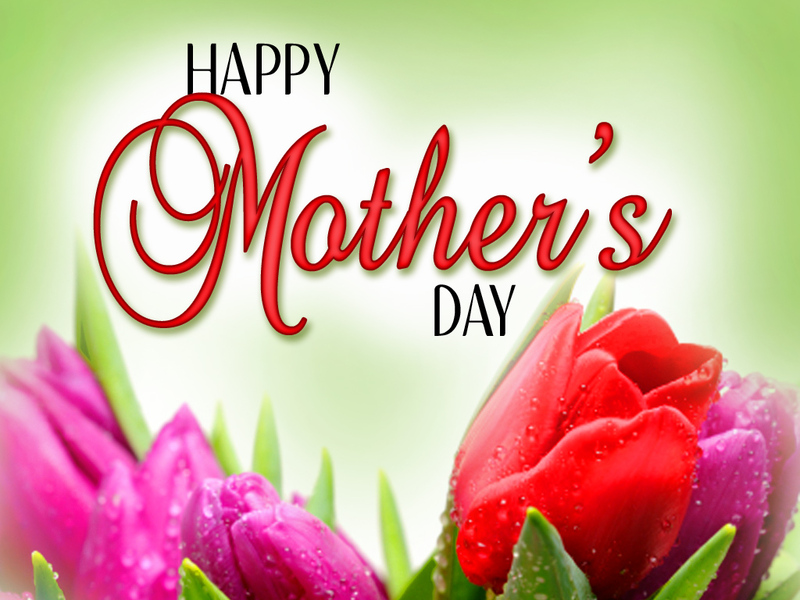 And for Mother’s Day, on Sunday, May 13, their Wagyu steaks come with FREE Soup, Salad, and Dessert! 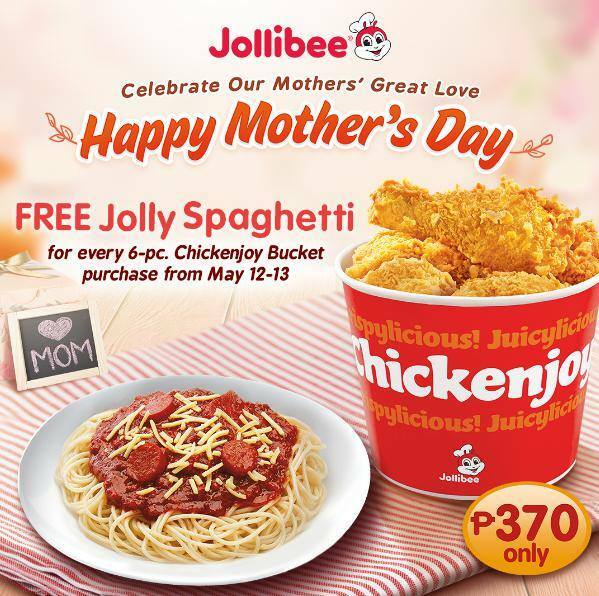 Celebrate your mother's great love by treating her to a delightful and sweet-sarap meal at Jollibee! Get a FREE Jolly Spaghetti for every purchase of our 6-pc. 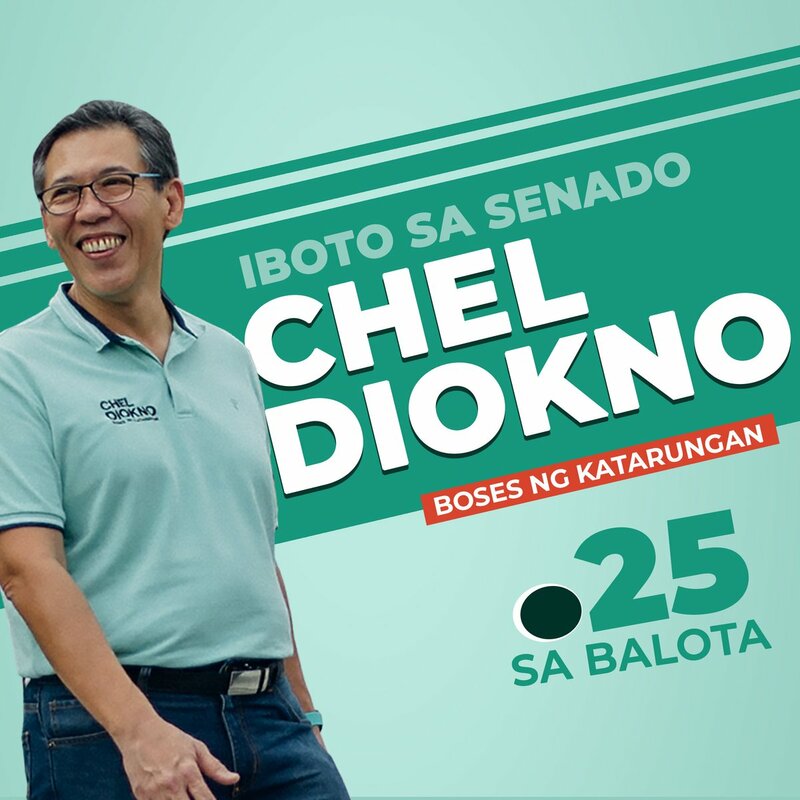 Jollibee Chickenjoy Bucket! Valid from May 12-13, 2018, for dine-in, take-out, drive-thru and delivery in all Jollibee branches nationwide! A special treat this Mother’s Day weekend at McDonald’s and enjoy this promo from May 12-13, 2018. 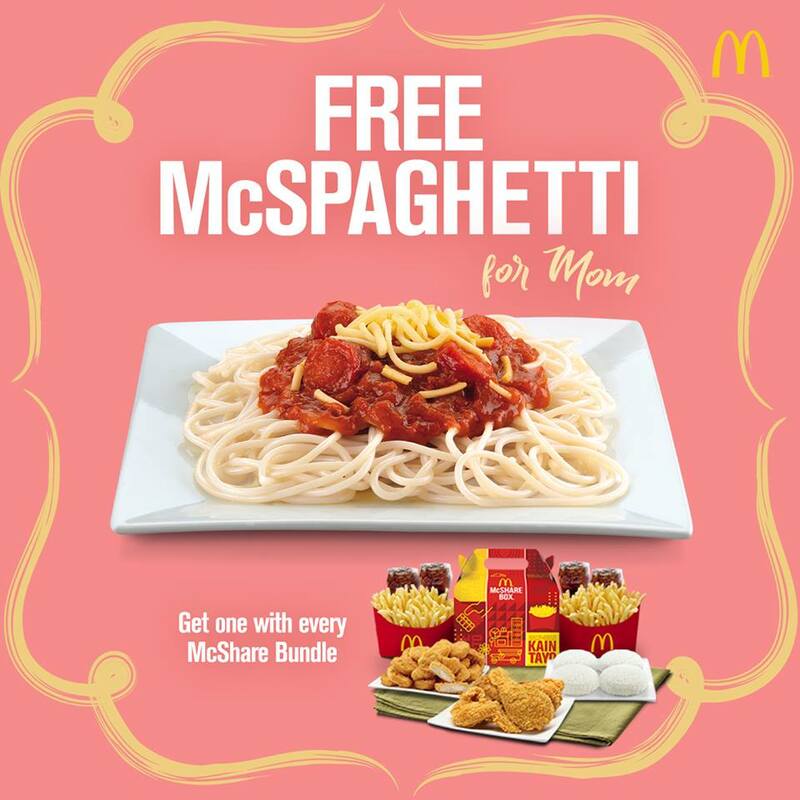 Get a FREE McSpaghetti for mom with every McShare Bundle (McShare Bundle for 3, McShare Bundle for 4, Chicken McDo & McNuggets Bundle for 3, Chicken McDo & McNuggets Bundle for 4, and 20-pc. Chicken McNuggets Bundle). Available nationwide, and valid for dine-in, drive-thru, and McDelivery web orders. Celebrate Mother's Day and enjoy this affordable and delicious Set Meal at Tapella Tapas Bar & Restaurant in Greenbelt. This promo is available from May 11-13, 2018. Call 0917-7124546 for reservations. All mom dine-in guests at Todd English Food Hall can get one complimentary dish among the Four Chef Specials for a minimum spend of P1,500. 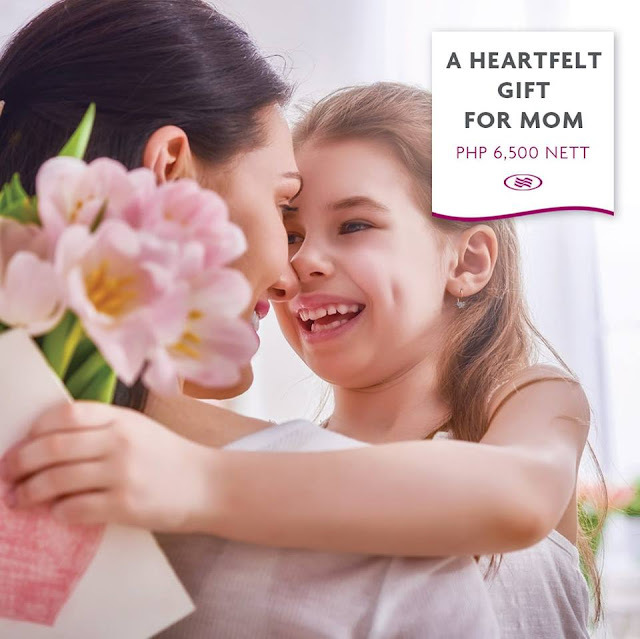 The Discovery Leisure Company invites you to have a memorable Date with Mom, consisting of lavish stays, delectable dining offers, and one-of-a-kind gifts—everything to show how special she is in your life. 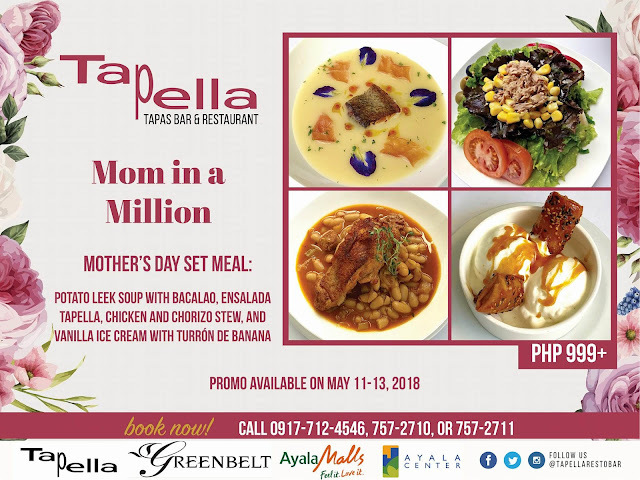 Please check complete Mother's Day Promos HERE. City Garden Suites treats all the mothers with “A Suite Treat for Mom” to celebrate Mother’s Day this whole month of May. From May 1-31, 2018, a month-long celebration of Mother’s Day at City Garden Suites, guests can book a Deluxe Room with a special room rate of P3,998.00 net per night and the whole family will get an instant upgrade and stay in a One Bedroom Suites for two (2) adults and two (2) children with buffet breakfast. The room package also includes a relaxing complimentary one hour massage for mom. Guests may also enjoy a complimentary slice of Ube Cheesecake or Kitkat Cake for any food purchase at Cafe Miranda. 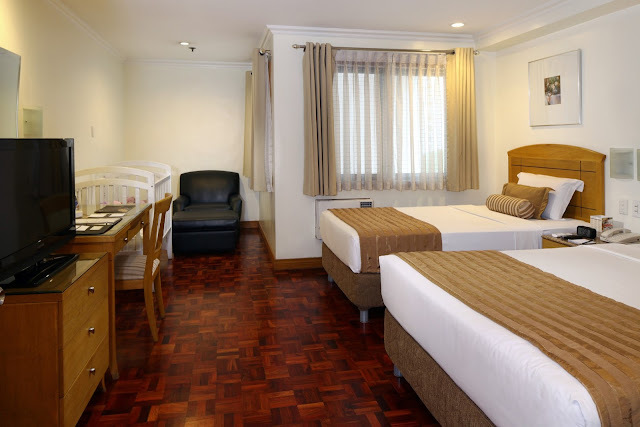 For bookings and reservations, please call (+632) 835-3831 or (+632) 536-1451 or visit www.citygardensuites.com. 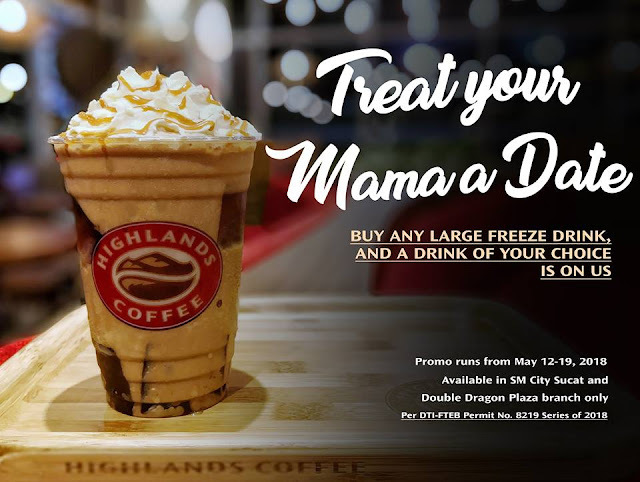 It’s time to “Treat your Mama a Date” at Highlands Coffee. From May 12-19, 2018, Buy any Large Freeze and a drink of your choice is FREE! 1. Cannot be combined with any other promo and discounts. 2. Only available at SM City Sucat and Double Dragon branch. 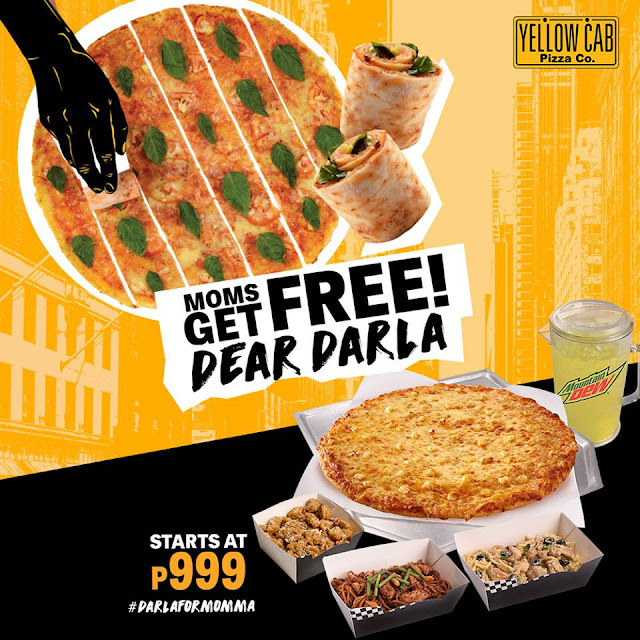 MOMS GET FREE DEAR DARLA PIZZA at Yellow Cab from May 12-14, 2018! Purchase any Squad Stuff bundle and you can choose from a free NYU Margherita Darla or OG Darla! Valid for Dine-In, Take-Out, and Delivery transactions in all Yellow Cab stores nationwide except Kidzania, MOA Arena, Brent, and Camaya Coast. Order thru delivery.yellowcabpizza.com or call 789-9999. 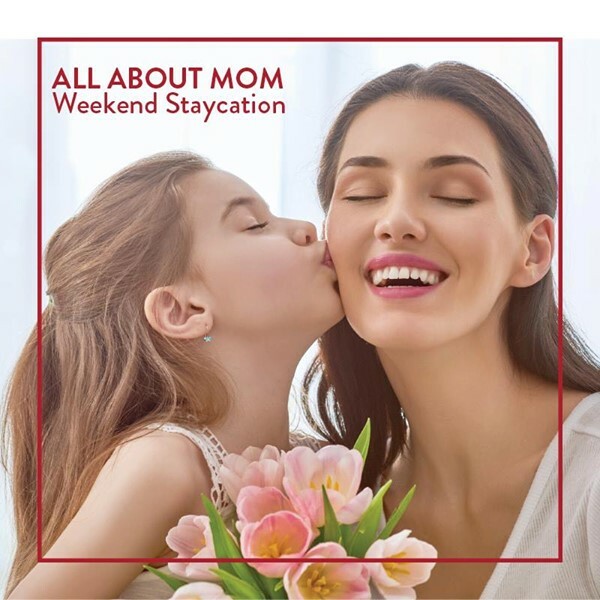 It's ALL ABOUT MOM Weekend Staycation at Crimson Hotel Alabang from May 10-14, 2018. INVIGORATE. 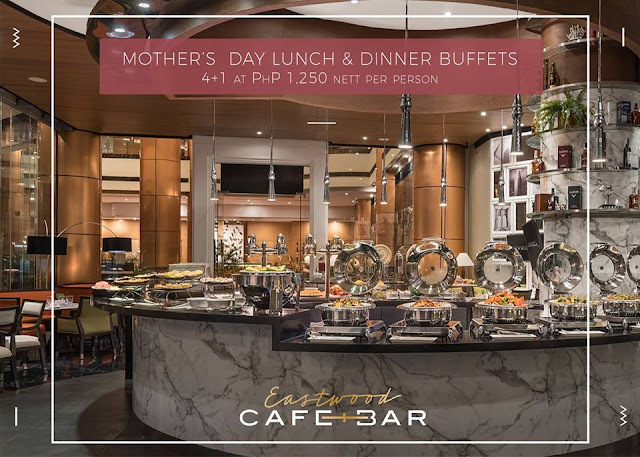 Starts at P5,888 net - includes an overnight stay in a Deluxe Room, buffet breakfast for two (2) persons at Café Eight, and a Pampering Kit. For booking, please visit www.crimsonhotel.com/manila and use promo code INDULGE or INVIGORATE. You may also email alabang.reservations@crimsonhotel.com. There's nothing in this world that can replace the sacrifices a mother has made. Express your love by giving her an incredible experience she will never forget through an overnight stay at Crowne Plaza Manila Galleria for only P6,500 nett. Booking period is from now until May 13, 2018, for stays on May 11 to 13, 2018. Treat your Mother this Sunday May 13 to a new seafood dining experience by the water! 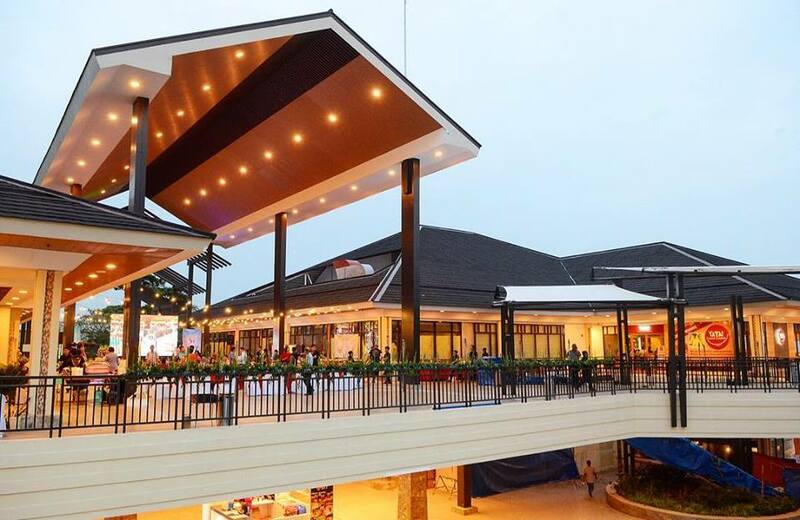 It's the grand opening Seascape Village, so come and celebrate with your mom, with fresh seafood cooked at stylish restaurants inside the village, and participate in some fun activities. Seascape Village is located at Atang Dela Rama Street corner Zolio Hilario Street (between Manila Film Center and Sofitel), CCP Complex, Pasay City. 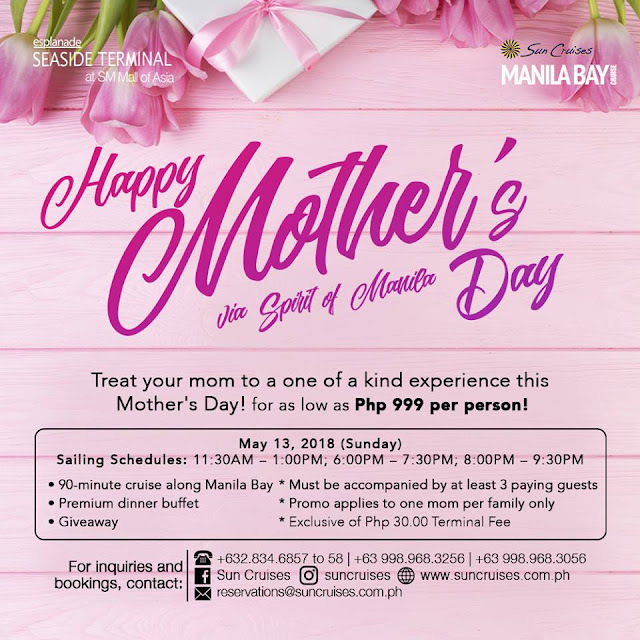 Show your mom she's the star of the family as Manila Bay Dinner Cruise honors her with a festive buffet everyone will surely savor! Indulge in a sumptuous feast of local and international cuisine. For every group of three (3), mom eats for FREE! 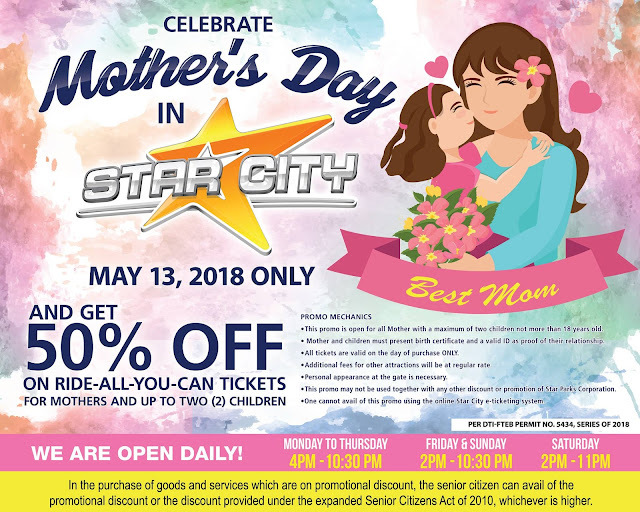 At Star City, enjoy 50% OFF on Ride-All-You-Can tickets to all mothers and a maximum of 2 children on May 13, 2018 ONLY!